I have newly started my vanilla forum. It is about all sort of Coffee Resources. Please comment and see if anything I could improve? I would theme it a bit more, that blue doesn't work well with food and drink. I would get more coffee in your design, but not overcomplicated. Yes x00, the next steps indeed I need to work on the theme, I purchased vanilla beans theme but doesn't work well on the current version. So now I am trying to DIY on own one but shame that I got only basic html knowledge, it seems that long to get there. Also, it looks like there is not many new theme to be downloaded or purchased. I think the redwood theme is for somethign else, I would say something lighter. Have you seen that there are color palettes on dribbble? That one looks coffee-ish. @coffeepig I started a custom.css file for you with some better colors used the logo as a guide for the pallet. These are the main areas to edit. But you can get an idea from this. Just paste this into a css file or create a new custom.css file for the default theme. I also recommend to get rid of Minify .... If you use my theme Glass, you can simply change the background to change the whole look and it would go with the coffee theme too. The "pig" part of the brand is understated. The name is a fun, playful. You have "like pig in mud", and coffee is a bit like mud. How would a pig drink coffee? Without burning its snout? Probably could use a straw, use its front trotters for a bit of purchase on the mug. I for one am addicted to coffee only once a day in the morning , but if you ask anyone about Turkish coffee they a will say it is muddy for sure !! Greek coffee is also muddy at the bottom but you don't drink that bit. @coffepig: Do also check my site VanillaSkins.com for Themes. Themes are low priced, might be an option for you. Good luck! coffeepig I started a custom.css file for you with some better colors used the logo as a guide for the pallet. These are the main areas to edit. But you can get an idea from this. Just paste this into a css file or create a new custom.css file for the default theme. 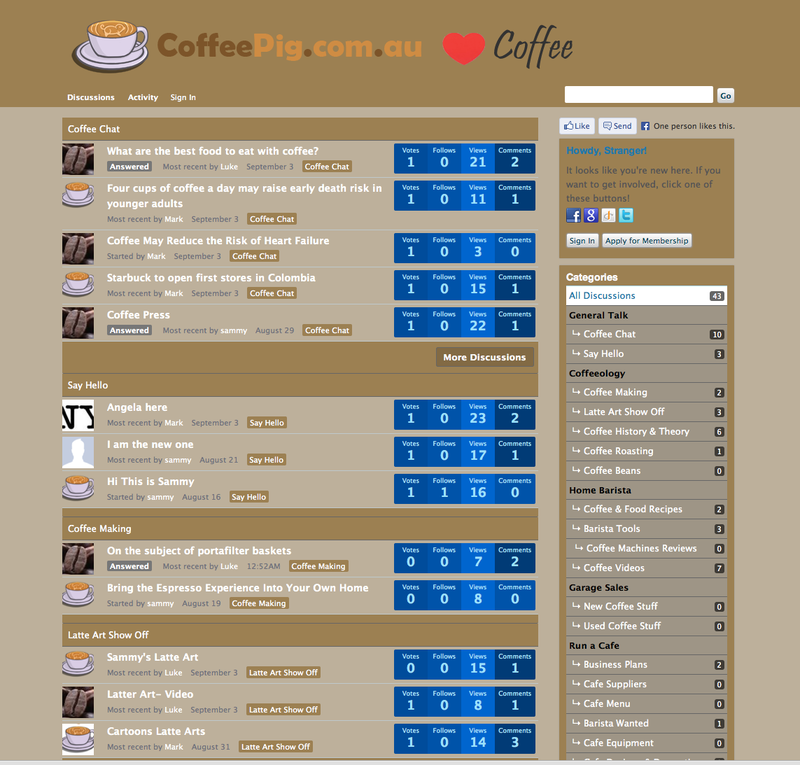 coffepig: Do also check my site VanillaSkins.com for Themes. Themes are low priced, might be an option for you. Good luck! Hi phreak, I purchased the theme from your website, but how can I download it? ?